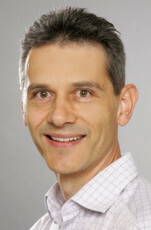 Wolfgang Heiss is head of the Solution-Processed-Semiconductor-Materials (SOPSEM) group, which has its facilities located at the Energy-Campus-Nürnberg (Fürther Straße 250, 90429 Nürnberg). Primarily, colloidal nanocrystals from inorganic semiconductors and metal-oxides are synthesized in organic solvents, for electronic device developments and photonic applications. Recently, such ligand mediated syntheses the SOPSEM group expanded to organic-pigment micro- and nanocrystals, with promising semiconducting properties and high photo-stability. These environmentally friendly organic pigments have not only the potential to replace inorganic colloidal nanocrystals in biomedical and electronic applications, but covered by functional ligands they are also applicable in fields such as photocatalysis or CO 2 capturing. As a second class of materials SOPSEM grows inorganic-organic hybrid perovskites with various dimensionality and crystallinity. Fundamental growth experiments are performed to widen the applicability of these materials from photovoltaics to fields such as X-ray detection and laser development. The SOPSEM group consists of members with various backgrounds, covering chemistry, physics and material-science. We continuously offer Bachelor and Master-theses with subjects related to these three work-fields. If you are interested to join the group please send an email.